SC103 SELF CONTAINED | Kuntzleman Electronics, Inc. 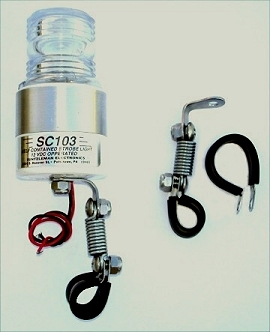 The SC103 STROBE is a self contained 12 volt DC operated light designed specifically for Ultralight use where an external 12 vdc power source (battery) is available. Its physical size is the smallest of any self contained strobe light in its class. Measuring 2 ½” dia. At the base and 4″ tall. Using the same xenon flash tube and Fresnel lens that is currently being used on its big brother the Single Magnum Smart Strobe. The brightness has been actual flight tested before sunset and is visible at 3 statute miles (FAR 103 requirement). The flash is in a single wink pattern at about 42 per minute, power consumption is 500 ma (1/2 Amp) and it weighs only 7 ½ ounces. The SC103 is mounted with a 1/4 X 20 stud located in the center on the bottom of the unit. Also, a stainless steel tang is supplied. Its rugged construction makes it a great economical stand alone unit. Available for any of the round head style units. Designed to be used when mounting the SC103 strobe in an area of high vibration.